One of the most frequently asked questions that I encounter from curious and eager enthusiasts who are just commencing their discovery of whisky is whether to add water to their dram and if so how much? For some reason this question is quite contentious in the whisky world and evokes strong emotions on both sides of the debate. I have frequently noticed that the strongest emotions come from the group representing “No Water in Whisky!” who are quite militant in their belief, flawed as it is. Now if you have any kind of background in law enforcement, or even as a school crossing guard, you will recognize my last comment as some form of a ‘clue’ about which side of the debate I’m on. I have yet to hear one unbiased argument for not adding water to your whisky sample when making an initial assessment. This small epistle is not a guide on how to nose and taste whisky but is a simple inventory of the advantages of adding water to your sample. The initial amount of water added is up to you and after your initial assessment you may decide in the future that this particular whisky is best taken neat. You may also conclude that it is best enjoyed with a large measure of water. Experience will help determine how much your sample requires but start off with small measures; you are aiming at reducing the nose ‘prickle’ so that you can appreciate the underling aromas. Professional noser’s dilute to 20% but they nose many, many samples in the course of their work and most enthusiasts find that 35% is a suitable level but once again your experience will be your best guide. You should also understand the difference between making an initial assessment and simply enjoying you dram in a social setting. In the latter case some people actually add lemonade or cola to their whisky but we will pretend that this doesn’t actually occur; some subjects are best not discussed in too great a detail. In your initial assessment of a whisky, you are doing yourself a disservice if you do not at some point add a small amount of water to your sample. This simple act of adding a little bit of water will have the effect of opening up the whisky to reveal hidden aromas in both the nose and taste which may be pleasant or in some cases, not so pleasant. The discovery of off notes and flaws is just as important as discovering unique and wonderful highlights hidden in the whisky. The addition of water, in varying amounts, reveals another dimension of whisky that would other wise not be viewed and experience will help you determine the amount to add to each sample. However if you never add water you will simple miss these important aspects of whisky assessment. An additional clue as whether you should add water to your whisky comes from the professional in the industry, the noser’s and blenders who all dilute samples with water to when making an assessment. I have attended and organized numerous whisky tastings over the years and have seen a myriad of approaches to sampling and assessing whisky from shaking the whisky to the other extreme of dribbling water down the inside of the glass so as not to disturb the spirit and bruise it. While each presenter has had their own unique approach and methods they all have one point that they agree on; the addition of a little water opens up the sample to reveal hidden pleasures. The water should be room temperature and never chilled and the addition of ice, for assessment purposes, is completely forbidden. Ice dramatically chills the whisky, closes down the nose of the sample and chills the mouth reducing the ability to taste. The water should be of the still variety and not carbonated. With experience you will find the best still water for the task. In some locations plain local tap water will suffice along as it is not chlorinated. I have heard of many silly excuses for not adding water from ‘it’s not manly’ which is too stupid to comment on further to ‘it’s the natural state’ of the whisky, this also is quite spurious as the Alcohol by Volume in the bottle is often mandated by local taxation rates. As an example the standard official bottling of Laphroaig 10 is bottled at 40% ABV in Canada and 43% in the United States of America. Which is ‘natural’? Local laws and marketing are now determining the natural state? 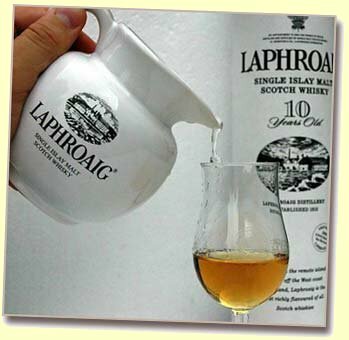 Further one could argue that the ‘natural’ state for a whisky is not how it is poured from the bottle but rather how it is taken from the cask or even straight off the still however in the later case it is not legally whisky. I can respect an individuals choice whether to add water or not but I have to wonder about their trying to prevent people from adding water under any circumstances. In any case you earned the money to purchase the bottle of whisky and it’s your choice whether to add water or not but if you don’t, you’re missing a large part of the whisky experience.